The game opened in a frenetic pace as the ball moved around the park like a synchronised pin ball. Birkalla created the early running through Ian Kamau, Lawrence D’Arrigo and the talented youngster Ryan Yates. The trio gave their forwards plenty of early service but the lack of conversions in front of goal for both sides was going to be the tale of the day. Birkalla had the first opportunity to open the scoring in the 5th minute when Fumiya Suzuki pounced on a loose ball, but his shot ballooned over the cross bar. MetroStars replied with a goal scoring chance of their own moments later when Liam wooding sent a neat through ball in the path of Terri Theodorou but his shot was wide of the target. MetroStars failed to clear a 9th minute corner kick by Suzuki and paid the price. A lapse in concentration by the defence allowed the opportunistic Radice to swoop, his shot through heavy traffic found its way into the back of the net to give Birkalla the opening goal. Birkalla continued to mount forward attacks with some fluent ball movement but found it difficult to penetrate the solid defending by Michael D’Alosio, Tim Henderson, Adam Van Dommele and Justin Davis. MetroStars had a great opportunity to get on level terms in the 22nd minute when some creative ball movement by Travis Dodd presented Wooding to fire on goal but his attempt sailed over the bar. MetroStars were able to wrestle the momentum away from Birkalla late in the first half as Fabian Barbiero was able to free himself from the close marking by Yates and Kamau, and bring his teammates Solagna, Wooding and Dodd into the game. A 33rd minute Dodd cross found Solagna but his header went wide. It was Birkalla’s turn to absorb MetroStars’s attacking forays and Adam Le Cornu, Tom Dittmar, John Paul Cirillo and Scott Nagel were up to the challenge, The Birks looked threatening on the counter attacks as they tried to catch MetroStars on the quick break out of defence. Both teams would have been pleased with their efforts going into the halftime break, in what was a very entertaining first stanza. It was MetroStars who were out of their blocks early in the second half as they searched for the equalising goal. Wooding had a golden chance in the first minute as he broke inside the penalty box but his shot on goal was denied by a great save by Birkalla keeper Julian Torresan. It was all MetroStars in the first twenty minutes of the second half as they kept asking questions of the Birkalla defence. Christian Esposito was introduced for the injured Theodorou and he didn’t take long to have an influence on the game as MetroStars continued to press high. A 74th minute Dodd header grazed the cross bar while a counter attack by Birkalla had Suzuki shooting just wide of the upright. Metro’s gilt-edged opportunity came in the 82nd minute when a long range Barbiero shot hit the underneath of the cross bar and bounced out to the relief of an anchored Torresan on the Birkalla goal line. A hush fell over the ground when MetroStar’s favourite son and South Australian legend Travis Dodd was stretchered off the park with what appeared a serious knee injury from an innocuous tackle. MetroStars continued to search for the elusive goal to take the game into extra time, but Birkalla were having none of that as they continued to mount their own attacks, an 86th minute strike by Suzuki hitting the corner of the cross bar. 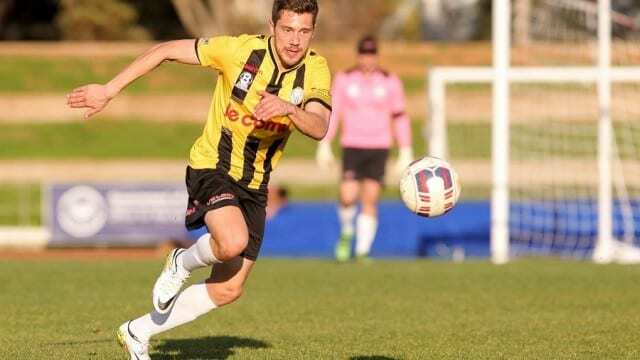 A disappointed MetroStars defender Tim Henderson said the lapse in concentration in defence gave Birkalla the early goal, which meant they had to chase the game. Henderson went on to say that the team believed they could steal a win if they all played their roles. It was a jubilant Adam Le Cornu who praised his team-mates’ efforts in what was a gruelling encounter. It’s lights out for MetroStars as they look towards the 2017 Season, while for Birkalla a date with Blue Eagles awaits them in the next round of the PS4 NPLSA Elimination Finals.